Caitlín Matthews is acknowledged as a world authority on Celtic Wisdom, the Western Mysteries and the ancestral traditions of Britain and Europe. In June 2014 I had the pleasure of taking part in celebrations to mark the 50th anniversary of the Order of Bards, Ovates and Druids (OBOD) in Glastonbury. Caitlín was a keynote speaker in her capacity as a former ‘Presider’ of the Order, a position she and John Matthews held jointly as internationally recognised writers on Celtic spirituality. She opened with a song and anyone who has heard Caitlín sing, will know that the audience was mesmorised, you could have heard a pin drop in that gathering of 400 Druids. In recent years the focus of Caitlín’s work has been the Lenormand Oracle deck. 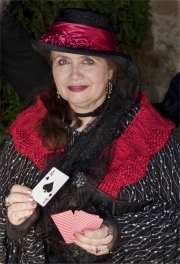 Her own Enchanted Lenormand Oracle was published in 2013 and her comprehensive practical guide to reading the cards – The Complete Lenormand Oracle Handbook was published in 2014. To gain an idea of the wealth of information in this handbook, check out Caitlín’s master class, Speaking the Oracle: How Lenormand works aloud. Here she talks with me about the process of developing the confidence to express your interpretation of the cards, of moving away from quiet contemplation of meanings with the help of books to ‘speaking the oracle’, to becoming a diviner. LINDA: What do you cover in the master class? I focus on how we speak the Lenormand cards aloud, how we tease out the meaning in order to express the oracle to the client. In ancient times, an oracle was a person, as well as a source of answer. A priest or priestess acted as the mouthpiece of the gods, giving inspired responses to those who came to a temple or shrine of a divinity with deeply serious questions. They would pray at the shrine and then stand before the oracle to ask their heart-felt question. The oral nature of oracles is one we shouldn’t neglect, because most cartomancy is a skill you express out loud and not in your mind or on paper. At some point you will need to speak an interpretation aloud to a friend or client and the earlier you start this, the sooner this skill will grow. LINDA: Who will find this class useful? CAITLíN: If you want to read for others, it means you need to become fluent in interpreting cards aloud first. Although I’m aware that many Lenormand learners or users may not be considering reading for others yet, I hope that this class will help prepare them for that day. For those who are already reading fluently, then I hope their reading will become sharper and more sophisticated. LINDA: Why does it take so long to learn Lenormand? CAITLíN: This is something that many complain about, I know! But if you want to read your Lenormand cards, aloud or silently, you have to learn their keywords first. There is no skipping this, just as you can’t avoid conning vocabulary if you are learning a foreign language. Then it is practice, practice, practice, every day. Any divination system is a craft and you don’t crack a craft in a few weeks. It may feel as if you’ve been stuck at the same level for a long time, without much progress, but speaking your cards aloud will move things rapidly along. If you’ve been reading cards quietly or in your head or just on paper, then the chances are that progress needs a little oral incentive. Say your daily 3 or 5 cards aloud to yourself and measure how this changes things over the course of a month! LINDA: What are the special challenges of reading Lenormand? CAITLíN: I think for most learners, it’s the sheer multiplicity of possible meanings. Just as a single word can convey shades and levels of meaning when placed in different contexts and sentences, so each card has a variety of expression. When people just look at books which give paragraphs of a single card’s possible meanings, they are overwhelmed by the possible applications: but this is like looking into a dictionary for a word that we want to put in a sentence. As you will know, do this in a foreign language and you can end up using a word out of context. The same applies to a card also. We need to find its scale and apply it intelligently. I talk about scaling a card or reading it on different levels according to context in my earlier classes, Lenormand, Past and Future. LINDA: So what enables us to read Lenormand aloud? 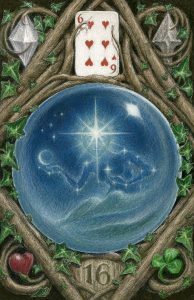 CAITLíN: With Tarot, most people are used to looking at the images on the cards to help interpret them, but with Lenormand we have a different kind of system that is already keyword based, so we start with a vocabulary and concordance of meanings. A basic fluency in a language like Lenormand will take you a long way quite quickly, just as a few standard expressions will enable a traveller to visit Italy for the first time. You can say ‘hello’ and ‘thank you’ and ‘I don’t want any more pasta’ in Italian, and read enough to work out where the bus stops, even though you may struggle to express how you feel when you are unwell or when you need help to change a tyre. I believe it is the context of a real question that helps us most. If you are struggling to learn the keywords and apply them, then you will soon speed up your reading by taking real questions – your own and those of others – so that each client’s own needs and concerns will help you engage with areas of interpretation you had not previously considered. This is why I give so many case histories with background in my Complete Lenormand Oracle Handbook, so that you can gauge the card’s response to a person’s question and context. LINDA: Is it just a matter of learning vocabulary then? CAITLíN: Well, not only do you have to read the cards in context with the question, but you also have to express what you understand in suitable language. How we shade the vocabulary of the cards is also a skill. If you read for an engineer you will use very different metaphors than when you read for a young English student or an elderly artist, for example; even though you drew the same three cards for each of them, what the cards said would be applied differently to their questions. It is also a matter of keeping your metaphors appropriate and understandable, without jargon. LINDA: Doesn’t that vary from client to client? CAITLíN: Of course! The way we read is not only about presenting what the cards say, it is about the tone and tenor of your interpretation too. You speak differently and more sensitively to a first-time father who’s not been sleeping very well than you might for a macho guy who is worried about keeping his girlfriend, but you would apply the same compassion. It isn’t that you will hold back on the truth, just that you will handle and express your findings in well chosen language without brutalizing, spooking, bewildering or upsetting your client. LINDA: Are there times when we need to be careful about what we say? CAITLíN: Indeed. Often what you do not say aloud is also responsible cartomancy. Sometimes you see things in a spread that should not be disclosed unless the client first speaks about it. I remember reading for a female client who was worried about her husband’s long absences: when I discovered Man on the house of Woman and Bear on the house of Lilies in the same Grand Tableau, my immediate impression from this and surrounding cards was that her husband could be a secret cross-dresser but, since this was information that might cause offence and had not been flagged up by her as a possibility, I kept my own council. These combinations could equally indicate that she and her husband cross-polarise the usual male and female roles between them. For advice on how to handle difficult events that are foreseen take a look at my divination blog. LINDA: Is there a quick way for even beginners to start reading the cards aloud? CAITLíN: I know that when reading Lenormand we don’t use single cards much, except when we are learning, but this is a way of getting oral with your cards. Get your cards to speak aloud to you by asking them a question. Then randomly draw one card and turn it over. Without looking up the meaning, what does it say back to your question? Do it lightning fast and without any pondering, using your quick fire wits. Here are few examples which I did with friends at a gathering: they came up with the questions and pulled a card while I spontaneously answered. I don’t normally read on Yes/No questions, but for this practice, it’s OK. These responses may not seem very serious, but everyone with whom I practised said they experienced an immediate sense of rightness about the response. These are not deep oracles, but they are real oracles nonetheless. If you are learning alone, you can make a list of small questions on strips of paper and draw one out randomly, and trying this quickly spoken oracle by pulling a card and making an instant response. If nothing else, you can test your growing knowledge of keywords this way. LINDA: What about people with a little more experience? What might be a next step? I have been employed as governess to my master’s young ward in a house in the north. He proposed marriage to me and I accepted, but at the altar, his previous marriage to an unfortunate lady still living came to light. I cannot stay in his employ. Please advize me as to my best course of action now? Whatever your capacity as a reader, you can draw 3-5 cards, do a 3×3 or a GT for this question: then every card will be speaking to you. Of course, the more you know about someone the less well you read normally, but with this method pretend the person is in the room with you and you are really interacting with him or her. The challenge is to read without the benefit of hindsight, of course, but this can build your confidence! Here are some cards from Bertrand St Guillem’s Palimpsest Lenormand to help you answer Jane Eyre’s question. What advice would you give her, based on these cards – Fox, Book, Anchor, Letter and Tower? Well, Caitlín has indeed issued a challenge. Let’s hear what you would say in answer to Jane Eyre’s weighty question. I’m sure Jane would be open to any number of responses! Hello, I think this is where I am supposed to reply to the “Governor’s question”? What I get here is that this lady should do legal research on this man and see if it is legal to go forward with this marriage. The fox being there tells that her marriage will not be legal if she does marry him because he is still legally married to the unfortunate lady. To walk away from him (lies) and avoid legal problems.